Not quite ready to sport that bikini? Do you need to create a healthy new habit?! It takes just 21 days. What if I told you that in just 21 days, you could drop up to 10 lbs, gain muscle, and feel better than you have in a long time? You totally can with Beachbody! My 21 Day Summer Slim Down Challenge begins on July 5th! I’d love to have you join us! Your Beachbody program of choice! Effective and fun daily workouts. A private, judgement-free place to share your struggles, celebrate your successes, ask questions and receive daily motivation. BONUS maintenance week to ensure you continue your new healthy habits! I am still a work in progress, but my life has been forever changed with the amazing support of my Beachbody family! Let’s do this TOGETHER! Sign up for your FREE Team Beachbody account HERE! Where are all my bargain shoppers at?? 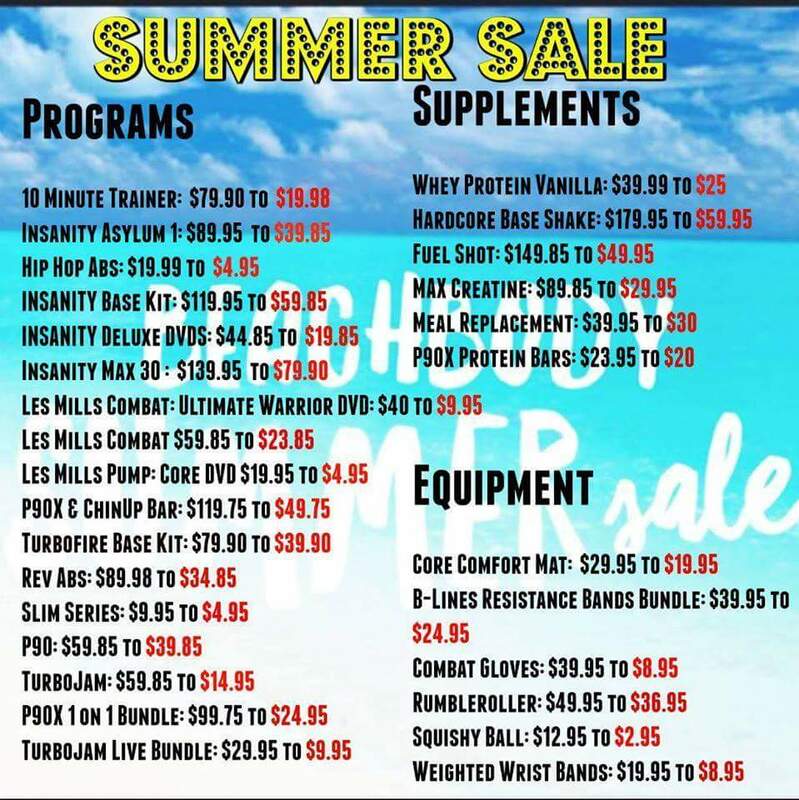 Beachbody’s Summer Sale starts TODAY!!!!!!!! They are offering HUGE discounts on select Beachbody products. What are you gonna grab?! Oh, and be SURE to pick up all of the Les Mills programs–that stuff is discontinued and you won’t have access once it’s gone!!!! Last thing–everything WILL sell out SUPER fast–so HURRY! 21 Day Fix Challenge Packs are BACK!! Stop the presses… Beachbody is running an A-W-E-S-O-M-E sale this month!! 21 Day Fix and 21 Day Fix Extreme challenge packs!! The main areas of focus for 21 Day Fix and 21 Day Fix Extreme are clean eating, portion control, and quick, effective workouts that can fit into a busy schedule. They are very straightforward, easy to follow, and have provided AMAZING results! And the best part is that they are FLEXIBLE! There is no specific (boring) eating plan and it’s completely up to you what foods you eat! Plus, with the original 21 Day Fix there are little perks like wine and chocolate. WHAT?!? Yep. It’s awesome! You have four different bundles to choose from!! You have your basic program + Shakeology challenge pack AND the program + Shakeology + 3 Day Refresh kickstart challenge pack! Click the links below to learn more about each option. With this Challenge Pack, you receive Shakeology and a 30-day trial membership to the Team Beachbody Club, plus the 21 Day Fix Extreme fitness program.